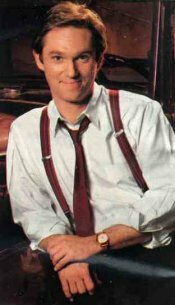 Richard Thomas is shown as he appeared in the November 20, 1993 TV Guide article "The Other Side of the Mountain" by Deborah Starr Seibel. Richard, who was 42 years-old at this time, was filming the CBS broadcast of A Walton Thanksgiving Reunion on Sunday, November 21, 1993. Previous to this he had gotten rave reviews for his performance in Shakespeare's Richard II. The picture was reproduced from a TV Guide magazine article dated November 20, 1993. The following table lists various facts about The Waltons. Please help me collect this information by correcting mistakes and adding information that is missing. My email address appears at the bottom of all pages. Came over from England in 1810 s5/e10. Four sons, Zebulon, Henry (oldest), Benjamin, and Matthew s1/e5 & s1/e12. Worked at mill on James River that was just above Scottsville, Virginia. Four sons Zebulon, Henry (oldest), Benjamin, and Matthew. Granduncle Mentioned in The Typewriter s1/e5, The Dust Bowl Cousins s1/e12. Died in a war according to Grandpa s1/e5. Father of Cora Walton Denby s1/e12. The Dust Bowl Cousins s1/e12. Son of Cora and Ham. Granduncle Mentioned in The Hertitage s2/e17. Granduncle Mentioned in The Conflict s3/e1. Gravestone: "Henry Walton 1845-1921 Beloved Husband of Martha Corrine"
Grandaunt Mentioned in The xxxxxxx. Died in the spring of 1888 (as mentioned in s?/e?, but mentioned she died the year before that episode s3/e1 occurred. John's second cousin from Doe Hill, Virginia. (born March 9, 1902, died April 22, 1978). Zeb says that Adam Walker first settled the Blue Ridge s4/e8. Best HS friend Fern Potter s2/e12. Cousin Sue Ellen's Savory Stew was passed on to Grandma s?/e? Uncle Mentioned in The Typewriter s1/e5. Grandma named John after "John the Baptist"
Organizes the area lumber companies into a co-op s7/e1. Her father and mother met when she was taking piano lessons, and the teacher's son broke a vase while admiring the girl s?/e? Mast on paper is "The search for the truth by which the good man never gets harmed"
Married John-Boy in A Walton Wedding 2/12/95. Worked at Jefferson Theatre (Magnolia Blossom Theatre burlesque show) s6/e7. Worked for Bobby Bigalow and the Haystack Gang, and the Sunrise Gospeleers (also called Sunday Morning Gospeleers). Worked as Cousin George on radio s7/e5. Nephew (Son of Jason and Toni) unknown. Niece (Daughter of Jason and Toni) unknown. Sister (oldest) Judy Norton (also, Judy Norton-Taylor). First boyfriend G.W. Haynes, they go to their first dance together s1/e24. Killed at Pearl Harbor, Hawaii, on December 7, 1941 s?/e? Nephew (Son of Mary Ellen and Jonesy) Christian Cousins. Niece (Daugher of Mary Ellen and Jonesy) Emily Ann Lloyd. Wife of Paul. Married during A Wedding on Walton's Mountain (1982). Divorced later. Daughters Susan and Amanda, and son (unknown). Principal of Walton's Mountain Elementary School in A Walton Easter (3/31/95). Married during A Wedding on Walton's Mountain (2/12/82). Divorced. Niece (Daughter of Erin and Paul) unknown. Nephew (Son of Erin and Paul) unknown. Youngest brother: the one with his eyes in the skies, mechanical abilities lead him to motorcycles, automobiles, and airplanes. Married four times before Cody: (1) Venable Carleton from Albemarle county, died from heart attack in London, (2) Carter Queenfield Harrison of Lynchburt, VA, a writer whom she divorced, (3) Tommy Chester, a graduate of VMI, a military man she also divorced, (4) Augusta, a stockbroker who committed suicide after stock market crash.